Children start to learn how to read by watching how others read, seeing what skills they are using. They listen to the words. And then they mimic and practice these skills by reading books that are suited to their level of ability and to their interests. It is during this initial stage, when children become aware (or conscious) that they cannot read, that their self-esteem is most vulnerable. This is why it is so important for us, as parents, to nurture them through this first, unstable stage. This support encourages our children to continue to practice their new skills by listening, watching and participating. They then pass through the conscious incompetence, stage, when they understand that in order to read they need to acquire the skills involved. As children practice reading and experience success doing it, their confidence and ability increase. They become aware of their new skills and use them in all sorts of situations. They have become consciously competent. Once they have reached this level, children enjoy reading not only because are they experiencing success but because they are able to understand and enjoy what they are reading. Here they move from learning to read to reading to learn: reading is a skill they have mastered in order to obtain knowledge. Read aloud to your children so they can see how you read, how you check the text for meaning and how you make sense of the words on the page. Encourage them to borrow books from the local library and later from their school library or classroom. When you take your children to the local library to borrow regularly, borrow books for yourself so they can see that you value reading too. Visit local specialist and secondhand bookshops. Get on their mailing lists for new titles, guest speakers and special offers. This makes books part of your family’s life in a natural and enjoyable way. Let your children see you reading for enjoyment and to gain knowledge – read novels and illustrated books, newspapers, local community papers and magazines. Read with your children – a wide variety of things, such as recipes, bus timetables, their school newspaper, medicine instructions, the television programs, movies with subtitles, junk mail, letters, email and the Internet. Children use a number of processes as they move through the learning stages. Alongside these processes are styles or preferences for the way people refer to learn. Some like to learn by doing, others by listening, watching or practicing in groups or alone; some use a combination of styles. How people learn may depend on the topic, the environment they are in or their mood. We do know that, like all of us, children develop their own learning preferences very early on and that these first styles remain fairly constant as they grow up. Studies have shown that using their preferred learning style has great benefit for children’s success in gaining new knowledge and applying it. And children who use a combination of styles alongside their preferred style have about a 70 per cent success rate compared with those how are taught using traditional or unsuited ways, who have only a 30 per cent expected success. Children who find learning easy can more readily recognize the ways – or styles – that have helped them learn successfully and they will re-use these ways in new situations. Others may need to be encouraged to find and develop the style that suits them best. As parents, we can provide many different ways for our children to learn to read at home so they can explore and decide what the best style is for them. Learning preferences are individual and so the way we learn many be different from the way our children learn. Being aware of –and also encouraging- these differences helps us to communicate better with our children as they learn. This is helpful when they are having difficulties. We can try another way to help them learn because we know that the method we are using may not be the best way to teach the concept to them. This makes our support helpful, enjoyable and effective. The various styles or ways of learning can be divided into four groups; visual (seeing), tactile (touching), kinesthetic (doing) and auditory (hearing and listening). We can include all these when helping our children, encourage their use and focus our attention on games that we can play and ideas that practice these ways. Pictures: Matching pictures to letters, such as ‘s’ = snake, ‘ea’ = seat, ‘ch’ = chime. Photos, movies: Making, reading and talking about the pictures in a cartoon. Making a cartoon and summarizing the main ideas or stages of a story you have read together in the frames. Watching movies of the book, such as Harry Potter, Miss Potter, Spot series. Drawings: Using color – such as different colored paper, post-it notes, highlighters, colored pens – for different information, using color codes. Modeling activity: Showing your children what they need to do and then getting them to copy or practice the method you have just shown them. It may be the way you sound out a word, the way you use your voice, or even as simple as the way you turn the page with your toddler. Symbols: Making flashcards, playing cards with words and sounds on them. Picture labels: Looking at picture books and identifying parts in the picture. Reading novels with pictures and talking about how the pictures add meaning to the message given in the words. Making letters out of hands-on manipulative such as spielgaben or clay and touching and tracking them while saying the sounds they stand for. Using the letters in kinesthetic activities. Making letters and words, and writing on different textured paper, such as sandpaper, bubble wrap, corrugated cardboard. Writing using different materials – for example, sand, shaving cream. Making letters in different materials – eg. Hands-on manipulative, plasticine, sand or clay – and saying the sounds they make. Using readymade clay letters, magnetic letters and wooden blocks or Lego to make words. Catching, kicking and passing objects as the children say rhyming words (cat, hat, sat, flat) or patterns they are practicing (station, mention, potion, lotion) and sounds (bat, ball, bin, bike, boat). Clapping, tapping, moving objects to sound beats in words such as three claps for bat: b-a-t. Listening to stories that are read out loud. Using songs and the rhythm of music to learn spelling, spelling patterns, rules. Recording study notes onto recorder. Recording stories for children to listen to. When saying sounds, articulating clearly, concentrating on the shape of the lips and position of the tongue. Closing eyes and listening to sounds, then matching them with the letters that represent those sounds. Using favorite songs and learning to read the words from the song. Adapting songs by making new lyrics. As parents, we can provide a variety of reading books, tactile reading games, flashcards, visual aids and activities to support our children’s individual learning styles. Remember that our children are individuals with their own capabilities and dreams. They may choose to learn indifferent ways to us – and want to learn different things – and that their success is built on a healthy and positive sense of self-worth, acceptance of their capabilities and a perseverance to reach their full potential. If we were to ask other adults how they learned to read, they would probably have difficulty remembering. For most of us, it has become an automatic process, and we moved successfully from learning to read to reading to learn. We may be more likely to remember what we have read and how we felt about the type of texts and experiences we had while we were learning to read. What we understand is that reading involves a number of processes that act together while we are reading. They are not obvious when the text we are reading is easy or familiar to us. But they are much more likely to become obvious if what we are reading is difficult and we do not understand the message of the words the first time we read them. When we pick up a book or magazine we usually know what to expect because we understand the different forms that writing takes. The look of the type will give us clues about where and what kind of information we will find – for instance, a short story or a poem will not be the obvious place to find facts about climate change, but we will know where to expect an introduction and an ending, and we will understand that it is different from a newspaper article or an entry in an encyclopedia. Reading is also about understanding the alphabet and the sounds that the letters of the alphabet make. It involves making images in our mind. It is about code-breaking: working out what the words say, understanding how the words go together and in what order they are most likely to appear. This helps us to know what kinds or words will be coming next, how to simplify or build sentences, and how to understand the important words so that we get the main idea about what we read. So, how do we connect these processes and help our children get the best possible start in reading, and then continue to support them as the complexity of what they read increases? All these ways of reading illustrate how children can see, hear and be involved with language. These are the ‘storehouses’ that we, as parents, can build for our children. Below one example of building these connections demonstrates how we can transfer this to the individual experiences that we have with our children. Read both non-fiction and fiction books about dinosaurs. See documentaries and fiction movies about dinosaurs. Visit the local museum and see dinosaur fossils and bones. Check out the Internet for dinosaur information. Borrow books from the library on dinosaurs. Listen to and imitate dinosaurs’ sounds from seeing them in movies. Provide dinosaur toys for imaginary play. Create dinosaur environments in the backyard where your children can play dinosaur games. Draw dinosaurs and add labels with their names. Make dinosaurs from clay, talking about the body parts and looking at pictures and models. Visit the zoo and look at the reptiles. Hands-on zoos allow visitors to hold some reptiles. Hands-on zoos allow visitors to hold some reptiles. Compare them to the dinosaurs. Make dinosaur fossils using plaster or manipulative. The idea that ‘reading is talking through the eye’ makes the link between speech and print. The first skill we must acquire when learning to read is known as phonemic awareness. It is about hearing sounds in spoken words. Once children are aware that speech is made up of a combination of sounds, they learn that these sounds can be written down. Hearing sounds is an essential first step in learning to read. Research has shown that if they don’t master this first step, children will have difficulty breaking the codes of more complex words as they continue through to higher levels of reading. Children begin to understand that we say sounds and we write letters – and that we write down sounds by forming letters. This is known as the letter-sound relationship. It is the next step in learning to read words. There is an important difference between hearing sounds and being able to see the relationship between sounds and letters. Teaching children the names of the letters of the alphabet does not naturally lead to an understanding of how words are read or written. There are many easy ways to build up an early awareness of sounds in speech before our children start formal schooling. The aim is to teach them to hear, see and feel the individual sounds in a word before teaching them what letters represent the sounds. This involves exploring three combining among Hearing, seeing and Feeling sounds. There are many ways to help children to hear, see and feel sounds in words. It is best to combine the ways we present new ideas to our children. This way, they can use a number of learning styles to help them understand the new concepts. This activity helps children to hear and count the individual sounds in words. It is a way for them to see the number of sounds. The sounds are represented by objects rather than by letters because then children are able to concentrate on hearing the sounds rather than on seeing the letters that represent the sounds. This activity allows them to hear the sound, say the sound and move an object to represent the sound. They are using seeing, feeling and touching skills to help them process the idea of hearing sounds in words. This activity really helps children in school when they learn how to spell words. Words with the same endings or sound patterns such as ‘light’, ‘fight’, ‘bright’ and ‘frighten’. Words on a theme, such as ‘beach’, ‘sand’, ‘water’, ‘umbrella’, ‘play’, ‘towel’, ‘castle’, ‘swimmers’, ‘swim’ and ‘waves’. Topics that are of interest, such as basketball cartoon characters and friends’ names. The child places a number of objects in a line. Choose a list of words to sound out and write them down. We can choose the words together with our child but don’t let him see them as we write them down. It is best to start with simple words and build up to longer and more complicated words. Say one word from the list to child and get him to repeat the word (umbrella). Say the word again very slowly. This way the individual sounds are easier to hear (u m b r e ll a). He repeats the word slowly (u m b r e ll a). As he says the word, he listens for the sounds. He feels the sound in his mouth and checks if his mouth, tongue or lips change shape. If there is change with any of these, it tells him a new sound is being made. As he says the first sound, he touches the first object in the line. He moves the object using his finger, bringing it closer to him. This beings a new line (u). He continues this process with the second sound (m). He keeps going until the word is completed, moving an object down onto the new row every time he hears a new sound (u-m-b-r-e-ll-a). In the example ‘umbrella’, he will have moved seven objects to form a new line. Say the word again together, but this time pointing to the counters (such as points from Spielgaben Set #10) as he says the word slowly. Starting with the first counter, he moves his finger along the line as he is saying the word. When he finishes saying the word, his finger will be on the last counter. Then he says the word at a normal pace (umbrella). S-w-i-mm-er-s (six sounds/ eight letters). The stretch-and-snap game helps children understand how words contain individual sounds that are put together. In addition, it helps them to practice hearing the different sounds that make up individual words. Place a thick elastic band on a table. This elastic band represents a complete word. When you first play the game, you can write a word on the elastic band so the child can see what happens to the letters as you stretch the elastic band out. Choose a number of words to sound out and write them down. Your child does not see the words you are writing down but she can choose the words with you. Lists can be made up as shown in the first activity. It is best to start with simple words and builds up to longer and more complicated words. Say the chosen word (for example, cat). She holds the elastic band in her hand and repeats the word (cat). The elastic band will reach full stretch at the same time as the last sound in the word has been said. When the elastic band has been gently released and is retracted, she says the word again at normal speed (cat). After the children have acquired an awareness of sounds, they learn that sounds can be written down using letters. The study of the letters that make the sounds is called phonics. Because particular sounds are used more often than others, children should be introduced to the most commonly used sounds first, rather than in the order that they appear in the alphabet. The letters that make up the alphabet are grouped into two categories,: consonants and vowels. Generally, the consonant sounds remain constant. However, each vowel can make a number of different sounds. When a vowel sound is given in the sound groups, introduce the sound in the example word given. Letters should be introduced in groups, in the following order. The letter appears with a word that uses its sound. Make a scrapbook: use a separate double page for each letter of the alphabet. Design the book in the order of the alphabet, starting from ‘aA’ and ending with ‘zZ’. Write the lower-case letter at the top of the left-hand page and the capital letter on the top of the right-hand page. Although the letters are set out in alphabetical order, the letters are explored using the order of the five sound groups (see above). Collect pictures of objects from newspapers and magazines that begin with the letter on the pages. Include photos taken during outings (which record the children’s personal experiences). Stick them into the scrapbook and label each picture. This helps your child to see the link between the sound and its letter, as well as seeing that print has a purpose. Carol Watson, Round the World Picture Word Book, Rigby Usborne, London, 1980. Claudia Zeff, The Animal Picture Word Book, Rigby Usborne, London, 1981. Playing matching games is also fun when children are learning to recognize sounds. This concept can be seen in many store bought games, such as jigsaws and computer games, but you can easily make your own ‘sound house’ game. Draw a simple house in a rectangular shape and divide it into sections that represent rooms (so that it looks like a ladder lying on its side). Draw another four houses the same, and divide them into rooms as in step 1. Each house is one of the five different sound groups (see example above) and each room belongs to a sound: print the letter that represents the sound inside each room. Starting from group 1, collect of draw pictures to represent each letter that matches the sound at the beginning of the word – for example, a picture of an apple would belong in the ‘a’ room, a monkey would belong in the ‘m’ room, and so forth. Arrange the pictures outside the house. Your child says the word for each picture, then the sound it begins with, matching it to the correct room in the sound house. Once he recognizes all the sounds in the house correctly, move on to the next house. Repeat step 3 and 4 with groups 2 to 5. Once all the sounds in each group are recognized correctly, the game can be played at a faster and faster speed. This builds up skills at matching sounds to letters. Making letters out of clay or hands-on manipulative is a great way to help children get a real feel and understanding of the three-dimensional quality of letters – and makes them seem real. Using magnetic letters, tile letters and felt boards are other ways to develop children’s awareness of letter-sound relationships. They can combine the letters to make words and change the beginning and end sounds to make new words. Now change the ‘c’ to a ‘b’. What does the new word say? Now change the ‘t’ to a ‘g’. What does the new word say? This is a great game for hearing sounds and for developing short-term memory skills. Choose a sound – for example, ‘b’. The game continues until you cannot think of any more objects to buy with that sound, or someone forgets something from the list that you have built up. Learning about hearing sounds is the first step for reading success. Playing games that help children to hear the sounds they say is the first step to understanding that sounds can be put-on paper using letters in a fun way. This awareness is essential because good readers are about to identify sounds in the words they hear, and know when they hear them to write them as letters. There are some strategies that help children work out words, they cannot read. These ‘cues’ are taught in school. The system is called the ‘three-cueing system’ because there are three cues to help them read an unknown word independently. Read past the unknown word to the end of the sentence. Think about what word will make sense in that space. Use the first sound to help you guess the word. Read back from the beginning of the sentence again to predict what word will make sense in that space and with the text you are reading. Look at the pictures to see what is happening. This may help you to guess the word. Look at the beginning, then at the end and then at the middle of the word. Stretch out and slowly say the sounds in the word. Then blend the sounds back together to hear the complete word. By thinking what will make sense and then looking at the first and end letter, often the word can be correctly predicted. Look at the shape and length of the word to see if it is like another word you have seen before. Cue 3: Re-read the sentence to check it makes sense. Read past the word and see if you can guess what makes sense. Read the sentence again with the word that has been guessed. If the word does not make sense, try again. If it does make sense, keep reading. If you still can’t guess the word, then keep reading thinking about the meaning of the story. After reading, ask someone about the words that you found tricky. Teaching children to recognize some words by sight builds their ability to recognize commonly used words and those words that cannot be sounded out automatically. There are several ways to do this and many games that can make it fun. Flashcards can be made of thick cardboard. One word is written on each card. Some of the words are sight words that can be sounded out, but most cannot and need to be recognized by sight. The cards are flashed or turned over one at a time and children say the word they see on the card. Generally, it is best for children to learn up to five words on flashcards before moving on to a new set of words. Children practice saying the word and learning to recognize the whole word, using the shape and letter patterns. Begin with up to five words at a time. Write one word on each card. Include a small picture or symbol of the word – this helps them associate an image to the sight word. Say the word. The child repeats the word. When he seems familiar with the word, let him say it without your help. On average, children need to read the word correctly three times without your help before they are able to remember the word automatically. To count as a mastered sight word, it must also be identified within three seconds. It is best to practice the same list of words for three consecutive days. Children may be able to read a large number of sight words out of context but they may not transfer this skill within the context of stories they are reading. When reading new or more difficult books with your children it can help by drawing their attention to words they know by sight before they read the passage. This is a fun ‘word hunt’ activity where they look for the words they know. It is also important to vary the order in which the sight word list is read when children are practicing so that they remember the individual words rather than the list order. Looking at the overall shape of a word – what it looks like when written down – can help children to remember the word automatically. Write the word in pencil. Get children to look at the overall shape of a word by first looking at the parts of the word that stand up tall and the parts that hang down under the line. They trace around the overall shape of each letter in the word with their pencil pressing hard onto the paper. After they have traced around the word, they lightly rub the word out to see the pattern that has been pressed into the paper. Now ask them to trace around the overall shape of the word, starting at the first letter and moving around the total shape of the word imprinted into the paper. Collect the patterns of many words and draw them on sets of flashcards. Write a list of words to match the patterns on another set of flashcards. These sets of patterns and matching words can be used in games such as the snap game. Match the pictures to the words on the matching set of flashcards. Use the flashcards to play word games, such as Memory, Fish, UNO and Snap. The game will have a collection of patterns and matching words. Lay the list of flashcards on the floor. Each card acts like a stepping-stone. The stepping-stones are across an imaginary river. Children say the word as they jump over the flashcard. When they reach the end of the stepping-stones and get to the other side of the river, they score points or rewards. There are many ways to continue reading with your children and help them to cope with the new texts they are working with. Taking turn about reading paragraphs with your children is one of these ways. This helps the ideas in the writing flow, allows them to listen and learn as you read to them, and gives them a break. They can follow the text, getting clues from the words and the ideas it includes, without having to work out the meaning of all the difficult words. A method called the NIM (Neurological Impress Method) is another way to read with children. You read the passage and they follow the words with their finger, saying the words just after you, like an echo. This method is helpful because they are actually reading ‘just’ after you. They are looking, listening and saying the words-and they experience fluency and success. This is particularly useful when children find a book challenging or if they are not particularly motivated to read. It is successful because they are practicing fluency in a non-threatening way. They practice scanning words from left to right and work with a person who is ‘modeling’ how to work out what the words say and how to make meaning from them. Asking questions helps children understand what the text means. Getting them to ask you questions about what you have read together is also very effective. Talking about the story helps them together is also very effective. Talking about the story helps them focus on important information – they can identify and check that they have understood the main ideas of the story. Asking questions about the events in the story and recalling facts is another helpful way to summarize ideas. Homes filled with books and other reading material help children to develop a passion and enjoyment of reading and see it as an integral part of their world. Promoting good reading behavior and a love of books are great assets. 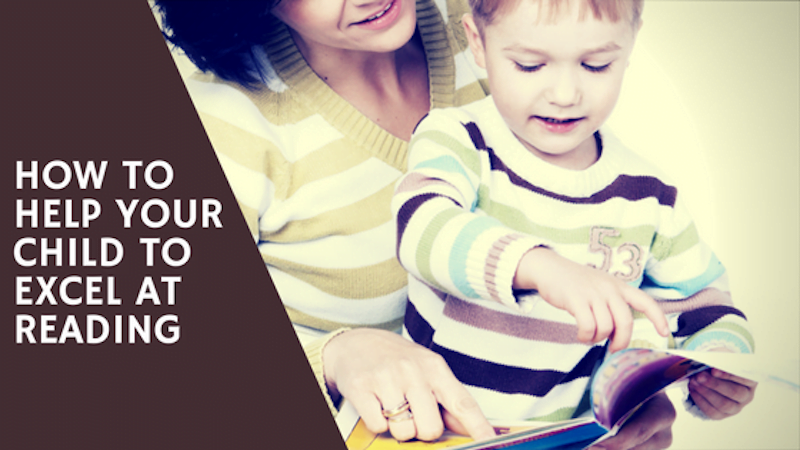 As parents, we can make reading practice at home as positive, relaxed and helpful as possible. We help our children make sense of what they reading. We gie them prompts so they can use the skills they have learned to work out the words. We help them to work out what the text means by talking and asking about the characters, the main idea and the events in the story. All the time, we should remember that everyone understands and interprets books differently, depending on age, culture, gender, place in the world and experiences so far. In this way, we help our children to see the world through books. It is wonderful to watch them developing their beliefs and values as they analyze and make judgments about the meanings and the images they read about. Help Your Child To Excel At Reading (2008). Katherine Bates. Very good article. Thanks! for sharing this post.